Google is somewhat clumsily calling it “Search, plus Your World.” You see, Google has years of experience in the search engine business. And they are so good because they aim to deliver what people are looking for, not just what they actually enter into the search window. They have to figure out if your search on “porter” is supposed to show a lot of beer websites or websites focusing on people who carry luggage. Part of what they’ve learned is that people want to see results based on their own personal history and social profile. Google search is still search, but now they are tailoring a person’s search to include results based on their social media profile. In short, Google is now including Google+ updates and people’s +1s (“+1” is Google’s version of Facebook’s “like”) in Google search. The “Your World” parts are indicated by a blue figure of a person’s head and shoulders. This blue icon in a Google search lets you know you or someone you know posted this. Any student of influence knows that this form of “social proof”—seeing faces of people you recognize—will significantly increase the likelihood you’ll click on a link. Google has said it would like to include other sites in Search, plus Your World results, but sites like Facebook and Twitter block Google from searching or indexing people’s public posts. While information from Quora and Flickr does surface, most of the social information is from Google+ posts. Here are 8 ways to help Google drive traffic to your site with Google+. Most of us have our industry-specific dialect. So we naturally try to use those words and phrases when we’re being intentional about our keywords. The problem is that most of our customers don’t use those terms or phrases. For example, here in Maine, the State Park employees may optimize their site to be found when people search for “Ft. Williams Park.” But 99% of prospective visitors will actually be searching on “Portland Headlight” so it behooves them to rank high for that term too. Put these keywords in the “about” section of both your page and your profile. And remember to use them when you’re posting updates and sharing images. 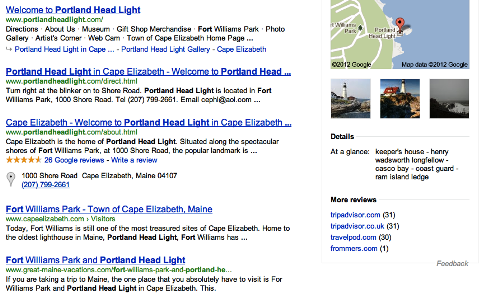 You might call your place "Fort Williams Park," but if your customers call it "Portland Headlight," you need to optimize your SEO for that too. In most social media training, we stress quality of engagement over number of followers or size of fan base. Usually, it’s better to have 8,000 engaged followers than 80,000 followers who ignore you. But current results indicate that a bigger Google+ following is better. Kristi Hines did an interesting experiment on Google SEO a few days before Search, plus Your World was released. She showed that more followers affected her search rank even when people weren’t signed into their Google account. Let people know you have a Google+ page. Put a badge on your website. Tell customers to put you in their circles. Include your link, or a prettier version of your link, in your email and print communications. Share your brand page posts through your personal profile. Brand pages are only allowed to follow people who have first followed them. So pushing your brand posts out through your personal profile helps your page posts receive more exposure. Make sure your employees have their own Google+ profiles and follow your brand page. Encourage them to share your page posts and then “+1” those posts. If you need help setting up your profile, check out 6 Steps to Getting Started With Google+. Google search is constantly categorizing and indexing information. 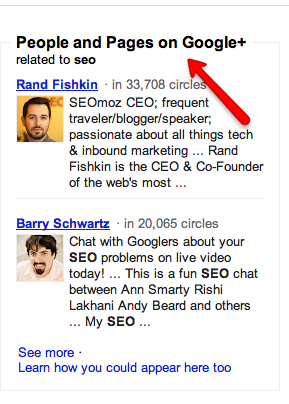 Now, in addition to search results, Google is sometimes posting “People and Pages on Google+ related to [your search term]” as a box on the right side of the page. Not all searches have this feature yet. But the benefit of being listed there is obvious. So train Google to know how to categorize your page by keeping posts on topic and using consistent keywords. Google says that as you post on the same topic, you’ll be conditioning Google to promote your page in that search. Not all searches have a "People and Pages on Google+ related to…" box yet, but repeatedly posting on the same topic will help your page be listed here when Google expands this feature. Last summer, Google started supporting an authorship markup. Basically, you can tag your work in a way that shows Google your writings across the web. It also allows Google to pull them together when people search for you. This step is bit more advanced, but can be well worth the effort. Kristi Hines gives detailed directions on how to implement the authorship feature. Another important way to help Google know how to categorize you is to include links between your business website or blog on your profile and brand page. It seems Google recognizes some features, like authorship, if you include a link to your Google+ profile or brand page on your business website or blog. One way to do that is to use Google’s own badge creator or one like WidgetsPlus that offers more design flexibility. Google+ gives you lots of options for sharing links to your other websites, your social media profiles and your brand pages. Google says one of the top three things to do to appear in results is to post and engage with posts. 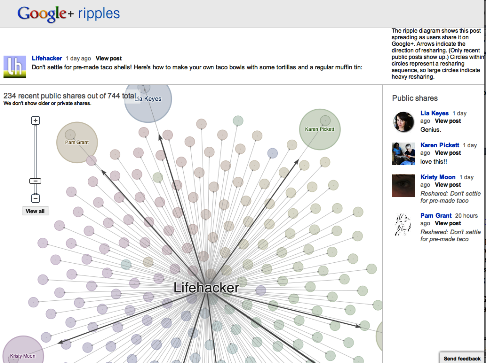 One way to measure the engagement of your updates is through a Google+ tool called “Ripples.” This cool pictorial tool gives you an idea of who is sharing your posts and who the key influencers are. The more you share with the influencers, the more engagement your posts should get. If Google is reporting on this engagement, they’re tracking it. If they’re tracking it, you know it’s influencing search. Share something incredibly practical and helpful to your niche. People on Google+ tend to respond well to both types of posts. Google is tracking the level of engagement for posts and letting you see it in a tool called "Ripples" which you can access as shown above. 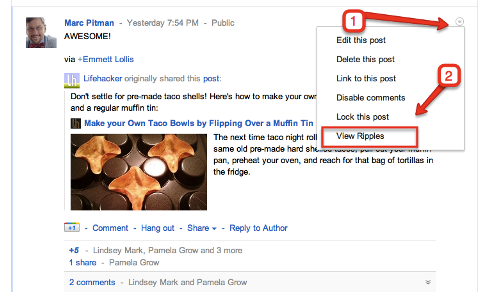 Ripples allows you to see who shares your updates. In most Google searches, you can now see an option to “+1” a result. Google is specifically using these +1 results in search rank. On December 10, 2011, at the Mediapost Search Insider Summit, Google’s Laura Kelley said that +1 and Google+ pages for brands will become a significant ranking factor for Google searches. You’ve probably noticed people click on pictures more than on text links. And many Google searches now include a prominent display for image search. So use images on your Google+ profiles and brand page. And make sure to use keywords in the “alt” field of all pictures on your own website. Using images can help you rank higher in Google searches with Search, plus Your World. 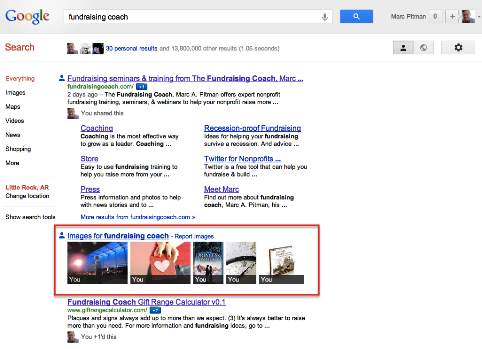 A quick search on "fundraising coach" not only shows my website, but also images of me speaking and images from my blog posts. Google+ updates are showing up in normal Google searches. This is an added incentive to regularly post and grow engagement with your posts! Google Search, plus Your World means that people can now see recommendations from their connections right in their Google search results. This is great for your business. People want to see social proof—proof that people like them do whatever it is they’re about to do. Google is offering that. This makes Google+ more important than ever for your business. Even if you don’t think your customers are yet active on Google+, you need to get on it for the SEO value. By doing some simple steps like consistently post on the same topics and grow your Google+ followers, you help Google drive even more customers to your site. What do you think? What other ways are you finding that Google+ helps with SEO? Leave your questions and comments in the box below.